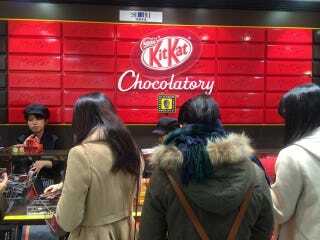 Earlier today, the world's first Kit Kat "specialty shop" opened in Tokyo. It's called the Kit Kat Chocolatory, and you can see a photo of it right up there. As previously reported, the new Kit Kat shop offers gourmet Kit Kats. That's it! There are three flavors currently: the "Sublime Bitter," which is made with couverture, "Special Cherry Blossom Green Tea," which uses extract powder from cherry blossoms, and "Special Chili," which has a chili pepper cream between the wafers. According to FashionSnap, the "Sublime Bitter" Kit Kat is limited to only 300 bars per day, because adding the couverture is done by hand. Each priced at 315 yen ($3) and a box of ten is 3,413 yen or $33. Since today is opening day, there were 500 bars of Sublime Bitter. According to FashionSnap, the shop sold out in one hour and forty minutes. Looks like there were lots of people ready to buy pricey, gourmet Kit Kats!